In this interview, David Dansky talks about Lionel electric trains, as well as model trains made by other manufacturers that didn’t survive the Depression. Along the way, he also offers a rundown of common train gauges and looks at some rare items, such as Lionel’s ill-fated, but highly collectible, pink-and-pastel train set for girls. Dansky can be contacted via David’s Toys. Lionel’s standard gauge 381e, produced from 1926 to 1936, was the largest locomotive the toymaker had produced. The first train I ever played with was during World War II in New York City. At the time we had blackouts because officials were worried about German submarines lobbing shells into the city. We would sit on the floor of my cousin’s apartment and play with the toy train—all of the windows were covered with blackout curtains. To this day I can still smell the ozone, which is the electric smell produced by the train going around the track. It’s like the smell of grandma’s cooking for some people. It gets in your brain and just becomes what you like. Those first experiences were probably one reason I started to collect trains. During the 1930s and ’40s, little boys dreamed about the trains in the Lionel, American Flyer, and Ives catalogs. They were filled with the presents we wanted for the holidays. In those days, the principal mode of long transportation was the train. If you wanted to visit the relatives, you went on the train from New York to Chicago or wherever. You didn’t hop on a plane and fly there. So our toys were transportation toys. Back then most people I knew couldn’t afford to buy the expensive electric train sets. As we got older and got a little discretionary income, though, we tried to relive our childhoods or make up for what we didn’t have. We started collecting and buying old toy trains to get a glimpse of the past. My dad bought me my first train set in 1946. Every time I got a little money for a birthday or a holiday, I would buy a little accessory or a car or something to add to the set. During World War II, companies weren’t allowed to make toy trains because all of the metal had to go into the war effort, but in 1946, Lionel and American Flyer started making trains again. I kept buying trains all through school and into college. So I guess I’ve been collecting all my life. 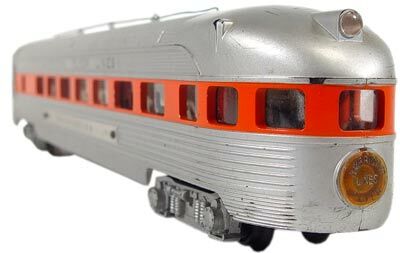 I collect trains manufactured by companies like Lionel, American Flyer, Ives, and Marx. Today my collection takes up two rooms. That’s probably about 1,500 square feet with 1,000 or more trains in it. Until the day I die, I’ll collect trains. Collectors Weekly: What models did you initially collect? Dansky: I started with O gauge. They’re trains with three-rail tracks made by Lionel. These days, my collecting focuses on Lionel trains made before World War II. They’re very colorful. I like them for the same reasons I like paintings by Degas or Matisse. Collectors Weekly: When were model trains first introduced? Dansky: In the 1870s, maybe even a little earlier. At first they were just little wooden trains for kids to pull around, and then cast-iron trains came along in the 1880s. The first electric trains didn’t arrive on the scene until the turn of the century, although I’m not sure of the exact date. Lionel made its first fuel electric train in either 1900 or 1901. The Germans may have made one a little earlier. The biggest German manufacturer then, and now, is Märklin, but there was another company called Bing. They were the major German companies, but companies all the over the world were making toy trains. At that time train travel was exciting. Orville and Wilbur Wright hadn’t flown anything yet. Collectors Weekly: When did collecting model trains become a hobby? Lionel’s Blue Comet set used the same 400e locomotive used during the prewar years, but in a different color. Dansky: Maybe in the 1920s or ’30s. The Train Collectors Association started in the early 1950s. At first it was just three or four guys getting together in Pennsylvania. It now has about 30,000 paid members, and there are probably a couple hundred thousand people in the country who collect trains. There are two kinds of collectors: the people who build them and the people like myself who collect them. Of course, some people do both. I don’t build anything. I just look at these beautiful old things that people put together, and I still play with them. They still work. Mechanically, they’re very simple and relatively easy to fix. They seem to run forever. I have one electric train that was built in 1903. It’s more than 100 years old, and it still runs quite nicely. Collectors Weekly: What drove the popularity of model train collecting? Dansky: Reliving youth, nostalgia. Some people got into it because they thought it would be profitable, but that was kind of silly. It’s not a great way to make money. Today, most train collectors are in their 60s, 70s, and 80s. Most of us are only one generation away from being World War II veterans. There are a few younger people who collect trains, but I’d say that not even 10 percent of the 30,000 members of the Train Collectors Association are under the age of 40. There will probably always be train collectors, but we’re becoming an endangered species. There’s no reason for younger people to remember toy trains because they’ve had little or no experience with real ones. Collectors Weekly: What was the first company to make model trains? Dansky: I don’t know. In the U.S., in 1900, Lionel became the first big company to make toy trains. American manufacturers made trains before Lionel, but Lionel is the one that really got train buying and collecting going. Ives came out with a model train before Lionel in the late 1800s, but it wasn’t electric. You pulled it with a string on the floor. Before 1900, a company called Howard made trains out of wood and cast iron, as did Biggs. Ives later made wonderful electric trains. During the Depression, Lionel was able to hang in there, but Ives went out of business. I have a few cast-iron trains. Some people only collect cast-iron trains, but I’m not one of them because they just sit there. They don’t move unless you push them. Collectors Weekly: What were electric trains made out of? American Flyer trains that ran on two rails, such as this observation car, were in S gauge, which was smaller than Lionel’s O gauge. Dansky: Before the war they were made out of metal. Then, after World War II, companies started making them with metal bottoms and plastic tops. Ninety-eight percent of the time the train came assembled, although there were also a few easy-to-assemble train kits available. In the beginning, Lionel was based in New York City before they moved to Irvington, New Jersey. Trains were much more popular on the East Coast than on the West Coast. Even today, the hub of train collecting is in Pennsylvania, New York, and New England. The trains that Lionel and others made were loosely modeled after real railroads. Most of the toy trains my kind of people play with are not exactly actual-scale models. They aren’t perfect replicas of actual trains, but they do resemble, in some cases, New York Central, Southern Railway, Pennsylvania Railroad trains. They weren’t exactly to scale. They were toys, so manufacturers took some poetic license, you might say. Collectors Weekly: Do people collect by railroad? Dansky: Collectors usually collect by gauge—that’s the width of the track. There are probably six or seven different gauges, but most Lionel people collect O gauge or standard gauge. People who run their trains outside in garden railways collect G gauge, which is 2 inches wide. Standard gauge is 2 1/8 inches and runs on three-rail track. O gauge is 1 1/4 inches wide. S gauge is also popular—it’s 7/8 of an inch between the outside rails. Then there’s HO, which is 5/8 of an inch wide, C gauge, N gauge, T gauge, and TT gauge. It’s kind of crazy. Collectors Weekly: What is the difference between scale and gauge? Dansky: Scale is the proportion of the train to the real thing. The chassis that the model train rides on is its gauge. Lionel is mostly known for O gauge and standard gauge. Those were gauges used for the bigger trains they made from 1907 until the beginning of World War II. Lionel also experimented with different gauges like OO, which was introduced in 1938 and produced until around 1941, to compete with HO. Later they made G.
My collection isn’t focused on any specific gauge—I like all kinds of trains—but my trains are sort of divided between O gauge and standard gauge. I probably have more O gauge than standard gauge. Collectors Weekly: Can you tell us a little bit about the birth of Lionel? Dansky: Joshua Lionel Cohen owned the Lionel Manufacturing Company. He invented things like the dry cell battery and made early fans, light bulbs, motors, and things like that. A friend of his in New York City who had a jewelry store asked him to come up with something for his display window that would attract people during the holidays. So Joshua made a wooden gondola (a type of freight car), put a dry cell battery in it, and put it on some track. He made the track 2 7/8 inches wide and ran the car around in the window of his friend’s jewelry store. Thousands of people came to see it. The jeweler was very happy because his customers bought a lot of jewelry, but people also wanted to buy the train. As far as I know, there are actually one or two early Lionel Manufacturing Company catalogs left showing this gondola and maybe a couple of other cars for sale, along with the company’s fans, electric motors, and things. That’s how Lionel got started. Lionel made these 2 7/8 gauge trains until 1907 and switched to its three-rail standard gauge in 1906/1907. O gauge, also a three-rail gauge but with 1 1/4 inches between the outside rails as opposed to standard gauge’s 2 1/8 inches, was introduced in about 1915 with electric-style engines. 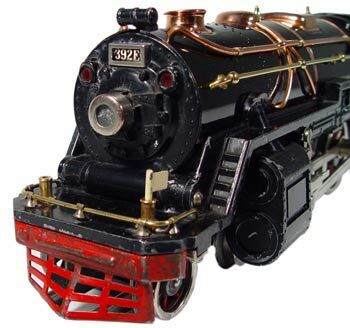 I believe the first steam-type engine in O gauge was made in 1921. The trains Lionel made reflected the trains people were familiar with. They made boxcars, gondola cars, engines, and passenger cars. They also made trolleys because a lot of people traveled by trolleys back East. Collectors Weekly: How were the trains marketed before World War II? Men like to play with transportation toys the most, but some of our most knowledgeable collectors are women. There are some women who were really—well, the only way to put it is—pissed off that their parents wouldn’t let them play with trains. Collectors Weekly: What are the most collectible Lionels? Dansky: We have to divide it into groups, based on the gauges of the trains. The first group would be called the 2 7/8-inch gauge. Those were the first Lionel trains. They were made from 1900 to about 1907. Very few of them are still around. Lionel’s 1957 Pink Girls Train set was a commercial disaster, which is precisely what has made it so collectible today. 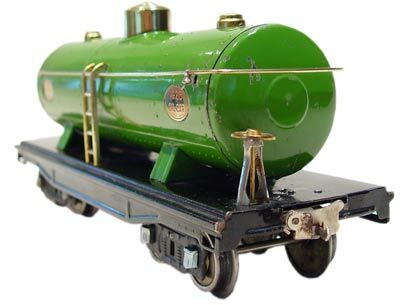 Then there’s standard gauge, which Lionel made from about 1907 until World War II. The two most popular and collectible standard gauge sets are the Blue Comet set and the State set. They’re both big, very pretty, and colorful. They’ll range in value from $5,000 to $50,000. One State set sold for $253,000 a couple of years ago, but that was a very special set. Then you have O gauge trains, which are the slightly smaller ones that most people remember from their childhood if they had Lionel trains. They made those from about 1917 and still do today today. Lionel made toys, so it wasn’t necessarily interested in making things exactly to scale, but with its Scale Hudson sets, which are their most collectible Lionel O gauge trains around, they decided to prove they could do it. So, from 1938 to 1942 they made those sets. They’re very expensive. When the set first came out, the engine alone cost about $100. If you can find a nice one of those engines today, it would be worth between $3,500 and $8,000 because they didn’t make many of them. During World War II, Lionel didn’t make trains; they made navigation equipment for the U.S. Navy and various parts to support the war effort. One of the most sought after postwar sets is the diesel engine Canadian Pacific Passenger set. They’re very pretty and highly sought after, especially in the original boxes. Original boxes make a big difference to collectors for sets made after World War II. Most of the boxes were just thrown away, of course. The other most-sought-after postwar set is the follow up to the Scale Hudson, the 773 Hudson. It’s the same body—actually to scale—but the wheels and other things aren’t exactly like an original New York Hudson. The third one I’d put in there is an anomaly. 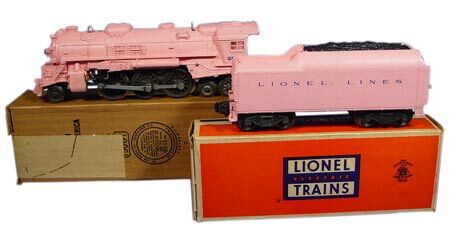 In 1957 Lionel tried to appeal to girls by making a set with a pink engine and pastel-colored freight cars. Girls took one look at it and said: “Yuck, this is awful. We don’t want anything like this.” So Lionel stopped production pretty quickly. Lionel remaindered it. They did everything they could just to get rid of it. Now it’s very valuable because they didn’t make many. It’s odd to see a bright pink engine with robin’s-egg-blue boxcars and lavender hoppers in somebody’s train collection. If you found one in the original box that had never been opened it might fetch as much as $25,000. Lionel has been bought and sold a number of times and is now owned by a holding company. Between 1970 and today, they’ve probably made 10 times as many trains as they made from 1901 through 1941. Another classic prewar Lionel standard gauge car was the 215 tanker. So today there’s no shortage of Lionel trains. The modern trains are fun. They have all kinds of modern electronic gadgetry, which old duffers like me really don’t care about because we’re collectors. We don’t know what the value of those things will eventually be but it probably won’t be much because they’ve made so many. In contrast, they made only one set during World War II, the Lionel Paper Train. It was packed in a box about the size of a Monopoly game box, and inside were sheets of cardboard. You punched out the pieces from the cardboard and assembled the cars with “Put tab A into slot B” kind of instructions. You could make a little cardboard train that said, “Lionel goes to war” on its side. Except for that, they didn’t make any trains from basically 1942 to 1945. In 1945, they made only one little set. They didn’t really start making trains again until ’46, but Lionel’s 1945 catalog had that little freight set in it. By 1946, a lot of the freight cars were built and designed like the prewar cars, but the company was moving to more modern electronic couplers and away from metal. In fact, after World War II, they used a lot of the same molds and body styles that they did before the war, but they started making the cars out of Bakelite instead of metal. The steam engines were still made out of diecast metal, as were the wheels, but they started using Bakelite and other forms of plastic for the cars and the bodies. Collectors Weekly: When was the Lionel diesel engine released? Lionel’s 2360 Pennsylvania GG1 electric locomotive was made between 1956 and 1963. Dansky: The first diesel was a Santa Fe F-3 diesel in 1948. Its power unit had two motors. It’s also referred to as the 2333 Santa Fe. The F-3 diesels became really popular and collectible. Lionel still makes diesels, lots of them, but the Santa Fe was the first. In a lot of ways it remains the most popular because it’s so pretty. Lionel was a strong company in the 1950s and peaked in 1956, ’57. That’s when they sold the most trains. My analysis is that after that, this one-eyed monster called television took over. Kids started watching more TV and spent less time playing with things like toy trains. After that, until 1970, each year Lionel’s sales declined. We thought they were going to go out of business in 1970. I think that was the year they were bought by a division of General Mills. Today Lionel trains are being re-issued by something called the Lionel Corporation, which is an amalgam of Mikes Train House (MTH) and Lionel Trains Inc. (LTI). MTH actually manufactures the trains in China and is licensed to use the Lionel name and identification plates. Collectors Weekly: How did companies like Ives, Dorfan, and American Flyer compete with the popularity of Lionel? Dansky: Ives and Dorfan were done in by the Depression, so they didn’t really compete with Lionel for that long. They were innovative in things like colors and types of trains, but Lionel always seemed to have the resources to be one step ahead of its competition. Lionel made it through the Depression because of the Disney handcars that they sold for about a dollar. They were very popular. Mickey Mouse, Minnie Mouse, Donald Duck, and Pluto were made out of a kind of papier-mâché composition. Over the years, these handcars didn’t hold up that well, so they’re very valuable today. Those little handcars that sold for a dollar or two, along with some little Mickey Mouse sets, kept Lionel afloat through the Depression. The other manufacturers couldn’t compete. American Flyer hung in there until Lionel bought them out. Collectors Weekly: Do you also collect Ives, Dorfan, and American Flyer? Dansky: To a lesser extent, yes. I have an Ives set from about 1901, a little O gauge electric set that’s kind of cute. They’re very tiny and delicate. The Ives trains that I really like are called the transitional trains, from when Ives started to go out of business, in the early ’30s. The Lionel 400e was a workhorse locomotive of the prewar era. Back in those days, the three guys who owned the toy train companies—Joshua Lionel Cohen, Harry Ives, and A.C. Gilbert—respected each other. Both American Flyer and Lionel supplied Ives Company with bodies, engines, and other parts that they needed to stay in business. Ives would install its own kind of couplers and trucks, and give the cars different paint schemes. Toward the end, Ives would take Lionel trains and put their own decals in the spot where the word Lionel would have appeared. Sometimes they only used slightly different colors. The other train companies wanted to keep Ives in business, but for some reason Ives just couldn’t compete. Today, its trains are considered unusual, pretty, and highly collectible. I have a bunch of those trains, especially in standard gauge, in the big passenger sets. Their big freight cars are nice, too. They’re very pretty. They’re sought after by a small group of collectors. Dorfan is even harder to collect because there was an impurity called zinc pest in the metal that was used to make most of Dorfan’s diecast engines and wheels. They were fine when they were first made, but over time a metal rot sets in and the metal expands, cracks, and crumbles. Today you’ll find very few Dorfan standard gauge trains, especially the electric engines, because they’ve basically broken apart. The steam engines a little less so, but they have the same problem. Ives trains have a zinc pest problem in some of its trains, too. It was an impurity in the metallurgy that manufacturers weren’t aware of. So Dorfan is really scarce, which makes it even more of a challenge to collect. I have a couple of big Dorfan standard gauge sets and some nice O gauge sets that have managed to stand the test of time. Not every engine crumbled, but probably 98 percent of them did. It’s very hard to find a Dorfan engine in good condition. Ives had the same problem with some of its toys, but not nearly as bad. Collectors Weekly: Who founded Dorfan? Dansky: Two brothers who made toys and trains in Germany had a company called Fandor. One brother came to the U.S. and decided to make O gauge and standard gauge trains here, so he changed the name around from Fandor to Dorfan. I don’t know exactly when they started, but I think they were out of business by the end of 1929. Again, the Depression got them. They made beautiful trains. They were the only train company that hand-painted metal-silhouette people in the windows of some of its passenger cars. There aren’t a lot of people who know or care about Dorfan, but it’s a pretty lively market if something nice comes up because so few of them have survived. Collectors Weekly: When did Lionel buy American Flyer? Dansky: Sometime after World War II. I don’t know whether it was in the ’50s or ’60s. Before World War II, American Flyer made O gauge and standard gauge just like Lionel, Dorfan, and Ives. After World War II, they didn’t make any standard gauge or O gauge. They went from three-rail track to two-rail track. All of their trains were S gauge—just 7/8 of an inch across the track, and a little bit smaller than an O gauge—and made to scale. American Flyer collectors like the fact that they’re trains are to scale and more realistic than Lionel’s. The average person looking at an American Flyer train might not realize that they are more to scale than Lionel’s, but they are. Collectors Weekly: What advice do you have for someone who’s new to collecting model trains? This American Flyer Bangor and Aroostook 982 boxcar is from the postwar era. Dansky: Buy the things that appeal to you aesthetically, and remember that the price you pay for anything is only the value of that train on that day. Do not buy toy trains or any other collectible as an investment. Buy it because you enjoy it. Right now we don’t know what’s going to happen with toy trains. We know that the number of collectors is shrinking, but that doesn’t mean it’s going to stay that way. Lionel is betting that it can appeal to kids because modern trains are equipped with all this computer stuff so they can run them much more realistically. That doesn’t appeal to most of us old-timers because we didn’t grow up with that. It doesn’t have any meaning to us. But Lionel is hoping that kids will get these fancy new trains and fall in love with them the way we did with the old engines that smoked and whistled when we were kids. Jerry, if you want information I will need to know more. Have trains by the phone and call me 9 a.m. to 9 p.m. West Coast time. Pictures sent to me would also be helpful if you want a cogent reply. Paul Stimmler, Library and Historical Committee, Train Collectors Association(TCA) Library, Strasburg, PA.
Paul is a true repository of wisdom and has added so much to our knowledge of toy trains. We are indeed fortunate to have his input. I have always thought of myself as a generalist who knew a little about a fair amount in the world of toy trains. The TCA Library in Strasburg is like the old library in Alexandria if you want to know all about toy trains. They do a superb job. I RECENTLY PICKED UP AN AF #4B TRANSFORMER AT A YARD SALE. I KNOW THEY WERE MADE BETWEEN ’49 & ’53. THERE IS A RAISED # PA 12 C 476 ON THE INSIDE OF THE FACE COVER. IS THIS A PART # OR A SERIAL # THAT I CAN TRACK TO FIND A MANUFACTURING OR ASSEMBLY DATE? IS THERE A PARTS BOOK OR REFERENCE BOOK I COULD SEE AT THE LIBRARY TO FIND THE INFO? Ken, see the comment above by Paul Stimmler of the TCA Museum in Strasburg, PA. Contact him and either he or one of his cohorts should be able to help you. You question is far beyond my repository of knowledge. Happy hunting. I am looking for the engine manufacturer(s) for American Flyer S-guage model trains. Have been unable to locate, (post-war). Looking for info on construction. So that I can maintain and re-build, if neccassary. Looking for pictures and diagrams, exploded views. Have started to collect AF models to refurbish and restore. New hobby @ age 62. First: Dear Cathy, my authoress and doctoress supremo! What a pleasant surprise to hear from you via this medium! All is well here in Ridgefield, WA. Please call if you ever get near Portland, OR! Any new books on the way? David, :-). I still feel even now like I should be saying “Mr. Dansky.” You were the best forensics coach ever! I’m still writing. Singing now, too. I’ve probably a book and a CD coming out in 2010. That should have said 2011 above. I have recently received a model train set from my Grandfather. I have been told that it was purchased in 1930. It appears to be the same model (381e) shown in the David Dansky article, however; It is red in color and I have been told it is an American Flyer model as opposed to Lionel. How might I identify this set? A.C. Gilbert Co of New Haven, CT, went bankrupt and the assets were sold and auctioned in 1967. Lionel bought the rights to the Am. Flyer name, as well as all tooling, but not the remaining AF inventory. Lionel did nothing with American Flyer, or with S-gauge trains, until 1979, in which year they re-introduced “American Flyer” S-gauge trains with the release of just four freight cars. The line expanded the next year, and AF S-gauge trains have been marketed by Lionel ever since (1979-2010)….in fact, now for more years than Gilbert made them (1946-1967). Repair parts are readily available for AF trains from several sources, including portlines.com In addition, there are other major manufacturers of S-gauge trains today, fully compatible with Am Flyer trains, including S-Helper Service, and American Models. Excellent article. One minor correction. American Flyer was owned by W.O. Coleman and made in Chicago. In 1938, A.C. Gilbert (who was a magician and Olympic pole vaulter and created Erector sets) bought out Coleman and what has become to be named Chicago Flyer. Gilbert started making 3/16″ (1/64th scale) models that still had O gauge chassis and used 3-rail track. Following WWII, Gilbert switched to 2-rail S gauge track for his fully 1/64 scale trains. Lionel bought out American Flyer in 1967 and starting re-making American Flyer trains in 1979. Have 1930’s or thereabouts sit on toy metal engine. 27″ x 10″ high x 7″ wide. When acquired it was painted over with several coats of different paint and used as a planter. Removed the paint with remover and faint logo on sides of coal car was Chesapeake & Ohio. I cannot find anything about this toy.. Would like to know mfg., colors etc. if you care to answer, would be very much appreciated. Great reading! Couple of comments: it is my impression (don’t recollect the sources) that the first electric trains manufactured in the USA were by Carlisle & Finch sometime before the turn of the century. Secondly, as far as I know MTH manufactures only “tinplate” equipment under Lionel license & has nothing to do with their current line of O gauge trains & accessories. What caught my eye (nose?) was the mention of the smell of ozone. I still remember the experience today, at age 68. Ahhh, how I miss those days! Yes, the ozone. As mentioned when sitting on the linoleum floor during blackouts in WWII (thought German subs might shell the Brooklyn Navy Yard) we played with my cousin’s Lionel 1688E with the Baby Ruth box car. The engine, sparking as it went around the track, gave off an ozone odor that is embedded in my brain much like my grandma’s meat rolled in cabbage. Days of innocence. i enjoyed reading the article . glad that david talked about those great old memories of childhood. our trains give us a chance to revisit those days. Hi. I have a Marklin Train Set 3114 and would like to know how old it would be and what it is worth today. Hope you can help. Thanks for the inquiry regarding the Marklin set. I am not an expert in this area; however, if you contact Martin Duenholter in Tacoma, WA he will be able to help you. I don’t want to publish his number on the internet, but you can find it through information. He is an attorney in Tacoma and is listed. Further to my comments in # 3 above we now in late 2011 have written documentation at the TCA Toy Train Reference Library (TTRL) in Strasburg PA that Hafner of Chicago was an investor in the Ives purchase in July 1928 along with Lionel and American Flyer(AF) . A lettter we recently acquired and archived and dated in the late 1930s from American Flyer President W.O. Coleman Jr. to famed toy historian and writer Louis Hertz states this specifically. Coleman goes on to say that “Hafner got out at the same time we did.” Meaning the following year of 1929 when Lionel bought out the AF and Hafner interest in Ives to then retain sole control. While there have been rumors that Dorfan of NJ may have been an additional investor in Ives there is no documentation to date to that effect. The fact that Dorfan bought some surplus Ives cars and locomotives from Lionel and repainted and renumbered some has apparently triggered that speculation, but we at the Toy Train Reference Library doubt it. Another company Fixen of the Richmond Hill section of Brooklyn NYC (1931?-37? )did similar things as Dorfan and bought surplus Ives coaches from Lionel and cut and stretched them and resold them under their own label. We have recently acquired a copy of the only currently known Fixen catalog and they apparently also made toy train repair parts for the model RR hobby. These are always fun speculative activities. But that does not (yet) make either Dorfan or Fixen a partner with Lionel in the 1928 Ives acquistion. A salute to David Dansky of WA for expanding the knowledge of vintage tinplate toy trains. Respectfully submitted, Paul Stimmler, TTRL,TCA Library and Historical Committee. I collect and operate my toy trains based on their aesthetic impressions on me. Value has no place in the equation. The problem we face in the hobby today is the demographic implications of an aging collector base and very few younger people with an interest in the hobby to absorb our collections when we pass on. I don’t believe we will ever go the way of the Dodo bird or the carrier pigeon, but will hang on like the whooping crane and the California condor. To those who might read this comment, remember to purchase collectible toy trains because you want to own them, like them and not because you think they might be hedges against inflation or important for retirement investment reasons. Collect, enjoy, operate and share your passion with the young people in your family and community. To Mr.Dansky , I really enjoyed this article and I especially appreciate the way you speak of the trains in your collection. i have a real love for trains myself being the son of a railroad man for over 40 years(he started with the cotton belt as a telegrapher and retired in 96 from the Union Pacific in St Louis. When i was very young in the 60’s, sometimes my dad would take me to work with him and one of my favorite memories was in valley junction Texas where the main line of Mopac crossed the main line of the Southern Pacific.There was a little ol lady who owned a trackside diner which was a converted old diner car. It was a treat to eat lunch there also i remember lots of hobos hanging out by a big water tank waiting to hop a freight outta their. I learned to love the thrill of travelling by train(sleeper car) and still do today with my family every chance i get.I highly recommend it for anyone not in too big a hurry to get somewhere. Hi, I am trying to find the name of a train set that I had between about 1943-1946. It was electric and the engine was streamlined and sparks came out of the funnel. It was grey and I think that there were at least 3 carriages each of which were tinplate and had the name of an American State on the side in white lettering and a white coachline, the last coach had a rounded back. I am sure that it carried the name MARX on either the train or the box. I still have the transformer and that carries the name LOUIS MARX, 200 Fifth Avenue, New York and recall that the track had 6 straight pieces and 4 curved. I played with my Uncles Lionel prewar trains when I was a child ( uncle born 1933) I believe the engine was a 392e but I remember it having 6 drivers. Does anyone remember a steam engine with 6 drivers – standard gauge -gunmetal gray with nickel railings and domes? The 392e looks like the one I remember but it only has 4 drivers. I cannot find any standard gauge prewar with 6 drivers! I do believe that all the large vintage Lionel standard gauge steam engines had four drivers. Their large electric engines, 402/408’s had eight drivers but that was because they were dual motored. It may be that when we are little things often look bigger in hindsight that you remember 6 drivers. Hope this helps. I have a Union Pacific 752W as advertised in Lionels 1936/37 catalogue. Does anybody know where I can get circuit diagram and or repair info. “ ” He brought an outsider’s design sensibility and work style that didn’t exist in the Southwest.